On Saturday 31 March, Botswana’s Ian Khama stepped down as the country’s president and a day later Mokgweetsi Masisi was sworn in. In a region which has seen two of the continent’s longest running presidencies – Robert Mugabe (37 years) and José Eduardo dos Santos (38 years) – Khama’s decision to respect the country’s term limits and bow out after 10 years was widely applauded. Botswana’s ruling party faces an election in just 18 months, so why would the president step down before the election? Incumbents win elections in Africa. When a sitting president faces an opposition challenger, the opposition wins just 12% of the time. But when an opposition challenger competes in an open seat election (after the president has stepped down), the opposition’s success rate increases nearly fourfold to 45%. Incumbents win more often due to the ‘incumbency effect’ – presidents can bend state institutions in their favour, frequently securing positive coverage in the public media, they use patronage and positions to buy loyalty, and they are able to introduce popular (or populist) policies to consolidate the ruling party’s vote base. In many cases, the president is also able to use state resources to campaign in the elections, severely skewing the playing field in their favour. Khama stepping down 18 months ahead of the polls allows Masisi to increase his chances of being elected in 2019, by accruing the benefits of incumbency and thus perpetuating the survival of the BDP. Botswana’s presidential terms are disconnected from the five-year electoral cycle – a trend that began after Ketumile Masire introduced presidential term limits and stepped down for his successor after 18 years as head of state in 1998. Rather than a marker of democratic governance, the uncoupling of the electoral timeline and presidential term limit is a mechanism for ensuring the continued electoral success of the ruling Botswana Democratic party – in power since 1966. History recalls Masire in a positive light, but his decoupling of the presidential and parliamentary terms was intended for the very purpose that it now serves. In 1997 when he changed the constitution, it was in response to the growing unpopularity of his ‘old guard’ due to serious corruption scandals; and it was done to stave off the threat of an electoral loss in 1999. Prior to Khama’s 2018 resignation, politics in Botswana appeared eerily reminiscent of the last days of Masire’s rule in the 1990s. Khama’s administration had been accused of growing authoritarian tendencies, corruption and populism at home – though his foreign policy stances were widely celebrated abroad. After 52 years in power, many Botswanans have begun to tire of the BDP. The party narrowly avoided defeat in the last elections, when they faced a more united opposition. In the 2014 elections Khama’s BDP failed to win an outright majority, garnering just 46.5% of the vote, while opposition parties shared 53.5%. The next 18 months will give Masisi time to consolidate his position within the BDP and take the lead on popular policies to address the corruption, inequality and unemployment that are seen to have increased markedly under Khama. While South Africa’s presidential term depends entirely on parliamentary electoral cycles, the predominance of the ANC – in power since 1994 – allows the party to similarly short-circuit the party’s electoral accountability. The ANC’s constitution provides for just two presidential terms as party leader – a convention that has been respected until now, notwithstanding Thabo Mbeki’s attempt to change it and Jacob Zuma’s intention to install a proxy. However, the party’s leadership renewal calendar installs a new party leader a little less than 18 months before the country goes to the ballot box. With the removal of Thabo Mbeki and now Jacob Zuma, the party has begun a similar (if less formalised) trend to Botswana, by delinking the presidential term from the electoral cycle. Jacob Zuma – and to a lesser extent, Mbeki – was removed to allow the ANC to revive their waning electoral legitimacy and clean up the party’s image in the wake of damaging scandals. After the party’s bruising loss of major municipalities in the 2016 local government elections and the decline of the ANC’s national tally to just 54%, most pundits predicted that the Zuma-effect would pull the ANC under the 50% threshold in 2019. The coalitions formed by the opposition to govern in Nelson Mandela Bay, Pretoria and Johannesburg have been seen to presage the need for a national coalition after 2019. The opposition Democratic Alliance was certainly hopeful. Instead, the removal of Zuma and installation of Cyril Ramaphosa as president led to a wave of positive sentiment – dubbed ‘Ramaphoria’ – which has bolstered the currency, helped stave off a downgrade to ‘junk status’ by Moody’s and left the middle class sleeping a little easier. The ANC hopes to capitalise on their renewed breathing space, and was reportedly considered bringing the 2019 elections forward to outflank the opposition. Introducing a new president – who is presented as a ‘new broom’ – ahead of an election can help revive the waning fortunes of a dominant party. This (to some degree) has helped reinvigorate the image of Tanzania’s ruling CCM which has been in power since 1962. Both the ANC and the BDP will be hoping that their pre-emptive moves to renew public confidence will pay off at the ballot box next year. By never running an open-seat election, these parties are likely to maintain their longevity for as long as the public is willing to give the new leader the benefit of the doubt. Nic Cheeseman, “African Elections as Vehicles for Change,” Journal of Democracy 21, no. 4 (2010): 139–153. Kenneth Good and Ian Taylor, “Unpacking the ‘Model’: Presidential Succession in Botswana,” in Legacies of Power: Leadership Change and Former Presidents in African Politics, ed. Roger Southall and Henning Melber (Cape Town: Uppsala: Chicago: HSRC Press; Nordiska Afrikainstitutet; Independent Publishers Group, 2006). Joel Konopo, “Bad Khama,” August 10, 2017, https://www.businesslive.co.za/fm/features/africa/2017-08-10-ian-khamas-growing-intolerance/; Monageng Mogalakwe and Francis Nyamnjoh, “Botswana at 50: Democratic Deficit, Elite Corruption and Poverty in the Midst of Plenty,” Journal of Contemporary African Studies 35, no. 1 (January 2, 2017): 1–14, https://doi.org/10.1080/02589001.2017.1286636. For example, Mahlatse Mahlase and Lizeka Tandwa, “It’s Not a Matter of If, but When Zuma Goes – NEC Sources,” The M&G Online, January 9, 2018, https://mg.co.za/article/2018-01-09-its-not-a-matter-of-if-but-when-zuma-goes-nec-sources/; Mogomotse Magome, “Graft Charges Make Zuma an Electoral Liability,” IOL, May 2, 2016, https://www.iol.co.za/news/politics/graft-charges-make-zuma-an-electoral-liability-2016402. Marianne Merten, “Analysis: Coalitions No Easy Route Come 2019, as Current Co-Operation Pacts Wobble | Daily Maverick,” The Daily Maverick, October 8, 2017, https://www.dailymaverick.co.za/article/2017-10-08-analysis-coalitions-no-easy-route-come-2019-as-current-co-operation-pacts-wobble/. “The ANC May Not Be the Government in 2019, Coalitions Are the Future for SA,” Democratic Alliance (blog), December 6, 2017, https://www.da.org.za/2017/12/anc-may-not-government-2019-coalitions-future-sa/. Sam Mkokeli, “ANC to Discuss Bringing Elections Forward to Capitalise on ‘Ramaphoria,’” Sunday Times, March 25, 2018, https://www.timeslive.co.za/sunday-times/business/2018-03-25-anc-to-discuss-bringing-elections-forward-to-capitalise-on-ramaphoria/. This entry was posted in Africa, South Africa and tagged Botswana, Dominant Parties, Ian Khama, Jacob Zuma, presidential term limits, South Africa on April 13, 2018 by Nicole Beardsworth. In just ten weeks, South Africa’s long-ruling African National Congress (ANC) will head to an elective congress to install a new party president who will be the party’s national presidential candidate in 2019. Struggling under the weight of compounding corruption scandals and a battle for control of all sectors of the state, President Jacob Zuma has pinned his fortunes to the candidacy of his ex-wife, Nkosazana Dlamini-Zuma, the former AU Commission Chair. Recently, Zuma (narrowly) survived his seventh parliamentary vote of no confidence, and is facing growing internal criticism by party heavyweights and the fracturing of the long-standing tri-partite alliance between the ANC and labour federation COSATU and the South African Communist Party (SACP). As a result, Zuma is frequently portrayed as being on the back foot. His current woes don’t originate in the (potentially soon reinstated) 783 corruption charges that he was facing prior to his presidency, nor the furore over the state financing of upgrades to his personal home, but from a trove of over 300 000 emails leaked to investigative journalism outfit, amaBhungane. These leaks detail the way in which Zuma’s friends and business associates – the controversial Gupta family – have used their political connections to act as gate keepers for dozens of state contracts, possibly amassing as much as R100 billion and shifting it offshore to accounts in Dubai and India. The leaked emails also suggest that, should Zuma’s succession plans come unstuck, he may be looking to relocate to Dubai. These emails helped to bring down London PR firm Bell Pottinger, as well as the South African leadership of auditing firm KPMG and software giant SAP, while many of the Zuma faction’s key acolytes at state-owned enterprises appear to be falling under the axe as reports of their financial crimes surface. But don’t count Jacob Zuma out just yet. Zuma is a master tactician – he was allegedly the reigning chess champion on Robben Island – and a securocrat whose closest allies are in the intelligence community. As a result, he appears to always be one step ahead of his detractors. Through his appointments to various key cabinet and government posts, Zuma has managed to avoid prosecution over the old graft charges and dodge any serious investigations over the current allegations of corruption that have tainted his legacy. The office of the Public Protector – previously staffed by a corruption-busting lawyer – has been undermined by the selection of an apparent Zuma ally, while the head of the national prosecuting authority seems to be missing in action. Ahead of the upcoming party and national elections – which will likely determine the fate of Zuma and his family – the president and his faction are trying to secure a win for Dlamini-Zuma. Bell Pottinger had apparently been asked to manage her campaign, but the campaign would only be successful on the back of sustained media coverage. A key Zuma ally who was responsible for ensuring positive coverage at the national broadcaster was removed in 2017, and the president has prevaricated on appointing a fresh and more independent board, chosen by parliament. Zuma has even gone so far as to have personal meetings with key SABC figures, potentially undermining the independence of the public broadcaster. The SABC is critical to the electoral fortunes of the ANC, and controlling the national broadcaster would help the Zuma faction to control the messaging ahead of the congress and national polls. As the ANC appears to follow the liberation party trend of moving from an urban-based to a rurally-based party, it will become increasingly important to be able to reach rural voters using the national broadcaster’s vernacular-language radio stations which have a listenership of over 37.6 million citizens – twice the number of people who voted in the 2014 elections. In order to control the election outcomes and ensure continued flows of patronage, it is critical that the presidency be able to bend the country’s financial policy and budget to his own ends. Reports that the presidency is trying to capture the Treasury are not new. Such reports were buttressed by the removal of technocrat Finance Ministers Nhlanhla Nene in 2015 and Pravin Gordhan in 2017, and their replacement by unknown or inexperienced finance ministers. New reports have now surfaced that the new finance minister, a Zuma ally and Gupta-associate, has established a parallel administration at the National Treasury, side-lining key technocrats and delaying important investigations into maladministration and corruption. In September, Cabinet announced that the budgeting process for the 2018/19 financial year would be ‘overseen’ by the Presidency – raising further concerns that the president would then have greater control over financial allocations. This is important as the President – and his preferred candidate – have been promising voters ‘radical economic transformation’ in order to shore up the party’s waning electoral fortunes and defuse the negative effects of Zuma’s numerous corruption scandals. This promised new policy is amorphous, swinging between being defined as the conditions to bring about a more egalitarian, inclusive economy and something approaching radical, racialized empowerment in productive sectors of the economy. Increased control over the 2018/2019 budget would allow the presidency to put into action some of the policies within this framework that, the faction hopes, would help the ANC carry the next national election. But Zuma and Dlamini-Zuma don’t have the congress sewn up just yet. There is increasing pushback from within the ANC, and key figures have come out vocally in support of Dlamini-Zuma’s strongest opponent – Cyril Ramaphosa. The battle has quietly – and sometimes not-so-quietly – been raging at the provincial ANC congresses, with each faction battling it out to have their supporters elected and thus to control which voting delegates are sent to the December congress. There has also been significant inflation of reported numbers in the party’s provincial membership, as the number of members that a province has determines how many votes they are allocated at the congress. The greatest disparities have been found in Zuma’s home province of KwaZulu-Natal (KZN) – this province already has the greatest number of ANC members and thus delegates at the elective congress, making it a key succession battleground. As Zuma’s support in other regions wanes, his faction is increasingly reliant on controlling the party’s structures in this king-maker province. The province has experienced increased levels of violence during periods of increased intra-party competition as around the 2016 municipal elections when more than a dozen council candidates were killed in the months before the polls. These killings have continued as the presidential succession race has heated up. In September the High Court nullified the election of a pro-Zuma ANC leadership in KZN, but a likely decision to appeal the ruling will probably leave the pro-Zuma leadership in place ahead of December. As for the other provinces with pro-Zuma administrations, Zuma’s support appears to be on somewhat shakier ground, making the battle for KZN a critical one. When it comes to Cyril Ramaphosa’s candidacy, it appears that the Zuma faction is willing to play dirty. In September, apparently-leaked emails to a local newspaper appeared to imply that Ramaphosa was embroiled in a web of adulterous relationships but the ANC heavyweight has refuted most of the claims, arguing that it was Zuma’s allies in the intelligence services who had hacked his emails in a concerted political smear campaign. Journalists from the Independent – which is owned by a pro-ANC businessman – have hinted that yet another big Ramaphosa story is on the horizon. The race is likely to get very ugly ahead of December, and many a political skeleton will probably fall out of the proverbial closet. But just which way the December congress will go, is still very much up for debate. This entry was posted in Africa, South Africa and tagged ANC, Cyril Ramaphosa, Elective Congress, Jacob Zuma on October 6, 2017 by Nicole Beardsworth. Last Friday, South Africa’s President Jacob Zuma kicked off a political firestorm after sacking his finance minister, Pravin Gordhan, along with nine other cabinet ministers. Gordhan was appointed following a similarly controversial reshuffle in December 2015 when Zuma was accused of appointing a relatively unknown backbencher Minister of Finance to clear the way for what many observers saw as his reckless and corrupt policy agenda. After markets sent the value of the South African rand plummeting, Zuma brought in the more experienced and well-respected Gordhan to restore confidence. Gordhan went on to challenge the President, working to root out cronyism in state-owned companies, resisting Zuma’s calls for expensive new nuclear power plants and generally working to ensure fiscal discipline. He also intervened to curb the influence in government of the by now notorious Gupta business family, who are close friends and political allies of Zuma and are accused of meddling in political appointments, using their political ties to further their business interests. Gordhan’s sudden removal shattered whatever confidence had been built, sending the rand into another tailspin and prompting the ratings agency Standard and Poor’s to downgrade South Africa’s credit to junk status. A political backlash also followed with criticism coming both from opposition parties and from within the ANC. Deputy President Cyril Ramaphosa and ANC Secretary General Gwede Mantashe, among other party heavyweights, were quick to condemn the President’s move while the ANC’s two coalition partners in the tripartite alliance, South Africa’s largest union Cosatu and the SA Communist Party, called for the President to step down. In general, South Africans are not interested in having the wool pulled over their eyes. While Zuma’s support remains strong in many rural areas, particularly his home province of KwaZulu-Natal, the ANC is struggling to maintain its hold over many of South Africa’s cities, as demonstrated during the last local elections. What’s more, the country has seen a rise in the number of protests as people decry deteriorating services and poor economic prospects in context of ever more endemic corruption. After the initial furore, the ANC itself appears to have opted for a strategy of damage control. Earlier this week, the party’s National Working Committee (NWC)—a body dominated by Zuma supporters—simply resolved to “discuss” with Cosatu and SACP calls for Zuma to leave while ignoring pressure to call an extraordinary meeting of the ANC National Executive Committee (NEC), which could take action to remove Zuma. While there are still rumours of internal manoeuvring to convene the NEC, other observers argue that the likes of Deputy President Ramaphosa may be biding their time ahead of leadership elections at the next party conference in December. Ramaphosa is a top contender to go up against Zuma’s former wife and favoured candidate, Nkosazana Dlamini-Zuma. The only other formal challenge to Zuma on the horizon is a no-confidence vote in Parliament scheduled for later this month. While a number of ANC MPs have resigned, presumably to avoid having to vote against Zuma and risk party disciplinary measures, the numerical strength of the ruling party in the legislature means the vote will almost surely fail. This entry was posted in Africa, South Africa and tagged South Africa on April 7, 2017 by Michaela Collord. The pressure on President Jacob Zuma remains intense as South Africa as he enters the last two years of his tenure ahead of general elections in 2019. Accusations of corruption, economic downturn and an increasing heated secession battle within the African National Congress (ANC) have all combined to keep the spotlight on Zuma’s performance. One of the president’s most vociferous opponents is Julius Malema, the leader of the Economic Freedom Fighters (EFF). Although Malema rose to political prominence as the leader of the ANC Youth League, he subsequently fell out with Zuma and was expelled from the ruling party. In opposition, he has effectively utilised populist strategies and political grandstanding to capture the headlines – if not always the votes – much to the chagrin of the ANC establishment. Among the tactics used by the EFF, one of the most high profile has been to use its presence within parliament – where it holds 25 seats – to frustrate and anger the president by interrupting him during his legislative addresses. In the past, this has led to confrontations between EFF and ANC legislators on the floor of the house, and the forced removal of opposition MPs who refuse to back down. In turn, these developments have positioned the National Assembly as a key battleground in contemporary South African politics in the in more ways that one. The political atmosphere within parliament deteriorated further on Thursday 9 February, as EFF leaders fired so many questions and challenges at President Zuma that he was forced to halt his keynote address, with Malema charging that he was “rotten to the core”. When Speaker Baleka Mbete ordered EFF MPs to leave, scuffles broke out on the floor of the house as legislative security officials – dressed in white – sought to physically remove EFF leaders, dressed in red. The extent of the disruption, combined with the striking colour coordination of the two sides, has ensured that the episode, which was broadcast live across the country, has captured headlines worldwide. While many aspects of the confrontation repeated previous incidents, there were also worrying signs of escalation. According to Reuters journalists, the scuffles continued into the parliamentary precinct – the first time that this has been reported. At the same time, police fired stun grenades to disperse rival groups of ANC and EFF supporters that had gathered outside of the building. Perhaps more problematically, anticipating opposition Zuma had earlier authorised 400 soldiers to join the security team outside of the building, leading to accusations that he was militarizing parliament. This decision united opposition parties in condemnation, with the Mmusi Maimane, the leader of the Democratic Alliance, announcing that his party would seek a court ruling to ascertain whether the president had acted illegally. More broadly, the willingness of the ANC to bring the security forces in to a political dispute has generated further concern about the party’s commitment to open and transparent politics in the run up to what are likely to be the most challenging general elections it has had to contest since 1994. This entry was posted in Africa, South Africa and tagged President Zuma, South Africa on February 15, 2017 by Nic Cheeseman. It has not been a good few months for President Jacob Zuma. Economic stagnation, public frustration at the slow pace of national transformation, and accusations of corruption concerning work done to Zuma’s Nkandla home, resulted in a poor performance in municipal elections held on 3 August. Although the ruling African National Congress (ANC) retained its position as the as the largest party, securing 53.9% of the vote, the government lost ground to the opposition in a number of important urban areas. Most notably, the best ever performance of the Democratic Alliance (DA) in a local election, combined with a strong showing by the Economic Freedom Fighters (EFF), which improved on its performance in the 2014 general elections, resulted in the ANC losing control of three metropolitan municipalities: Nelson Mandela Bay, City of Tshwane and City of Johannesburg. One consequence of these trends was an increase in the number of areas with minority and coalition government. Zuma’s position was further undermined by a report by the former Public Protector (a statutory position designed to “strengthen constitutional democracy by investigating and redressing improper and prejudicial conduct) Thuli Madonsela into accusations of corruption against the president. Anticipating a negative outcome, Zuma had tried to block the publication of the report in the courts, but was ultimately forced to drop the case. While much of the 355 page report confirmed what the president’s critics had already alleged, the publication of the document has been cited as a “game-changer” in the country’s politics. On the one hand, the length and depth of the report removed any last vestige of doubt about Zuma’s culpability in the rise of clientelistic and corrupt networks within the ANC. On the other, the evidence provided in the report regarding Zuma’s relationship with wealthy businessmen such as Ajay Gupta, shone a new light into the inner-workings of the patrimonial practices that now animate the ANC. • Ajar Gupta offered the Deputy Finance Minister Mcebisi Jonas $44.6 million to take the post of Finance Minister and advance the Gupta family’s “business ambitions”. When he refused, the post was given to an ANC MP with far less experience. • The government media chief Themba Maseko was told by Zuma to help the “Gupta brothers”, who subsequently asked him to direct advertising to a newspaper set up by the family. • Not only was the board of the Eskom utility company improperly constituted, but it paid nearly $70 million to a firm linked to the Guptas. • Many of the deals that Zuma facilitated for the Guptas – a network branded the “Zuptas” by opposition parties – involved the president’s son, Duduzane. Following the report, protestors marched on Zuma’s office in Pretoria, demanding his resignation. Perhaps more significantly, the National Education Health and Allied Workers’ Union (Nehawu), the biggest affiliate of the Congress of South African Trade Unions (COSATU), called on the president to resign in the interests of the country. This was a particularly significant move given the strategic importance of COSATU, which is one of the members of the ANC’s “triple alliance” along with the South African Communist Party. Moreover, rather than simply criticising the president, Nehawu’s leadership set out a concrete set of proposals for his removal, arguing that deputy president Cyril Ramaphosa should be promoted to caretaker president. However, despite the gathering storm clouds, Zuma may live to fight another day. Although Madonsela’s report was damning, it was not the “knock out” blow that opposition parties had hoped for. Significantly, instead of recommending any punishment directly, the report calls on the president to establish a judicial commission of enquiry. This could take some time – and could be drawn out in such a way that Zuma makes it to the end of his second and last term as president. Even if such an inquiry were completed more quickly, and gave grounds for impeachment, it is unclear whether there would be support for this within the National Assembly. One feature of corrupt and clientelistic regimes is that they tend to enjoy strong levers of influence internally, and the ANC currently holds 249 out of 400 seats in the lower house. Of course, the longer Zuma stays in office, the more likely it is that voters will seek to punish the ANC for his misdemeanours. But it is important to keep in mind that this is not the first time that Zuma’s downfall, and the breakdown of the triple alliance, have been prophesied. Back in 2013, South Africa’s largest trade union, the National Union of Metalworkers of South Africa (Numsa), called on Zuma to resign and said that it would not support the ANC in the 2014 elections. However, neither this, nor the fact that Numsa was subsequently expelled from COSATU, and hence the triple alliance, prevented the ANC from securing over 60% of the vote. It is therefore too early to talk of the end of Jacob Zuma. Characteristically, the president has come out fighting, and the early signs suggest that he will seek to challenge the findings of the report in court. Such a move would further delay the president’s day of judgement, and suggests that he remains determined to control his own destiny. This may yet include seeing out his term in office, and continuing to shape ANC politics long after he has stepped down from the presidency. This entry was posted in Africa, South Africa and tagged South Africa on November 13, 2016 by Nic Cheeseman. The regime changes in South Africa and South Korea provide interesting insights into the role of presidential leadership during democratisation. In both cases the incumbent leader was forced to choose to subject their position to a democratic vote, thereby facing the risk of defeat. Echoing the point made by Escribà-Folch and Wright (2015), the respective regime types made this option viable as there was a belief that victory was possible and the status quo was increasingly unsustainable. F.W. de Klerk in South Africa was head of the National Party and had some hope that he would be able to retain power through democratic means given the institutional base and resources of the party. Similarly, Roh Tae Woo’s military background provided an institutional base on which he could rely to ensure stability and call on for support, in spite of his move into a civilian role. The position of President and head of a formal institutional apparatus gave them authority and control, which facilitated a degree of confidence that they could make the transition to democratic leadership successfully. However, the decision to accept the need for reform was not driven by altruistic ideals. Opposition to the incumbent regime structures had been growing significantly by the time each leader came to power, limiting the space they had to operate. South Africa had seen sustained social protest against the apartheid policies and faced growing foreign pressure in the form of sanctions and boycotts. At the same time, de Klerk faced internal divisions as hardliners within the party sought to block reforms. Roh Tae Woo faced extensive social protests against continued authoritarian rule, having taken over from Chun Doo Hwan who had been forced to resign in the face of widespread and sustained social unrest. The issue of continuity is particularly important in these two cases. Both de Klerk and Roh assumed the presidency following the inability of their predecessors to continue (due to ill health and loss of legitimacy) during periods of instability. Taking on the role at pivotal moments provided an opportunity to make a change that had not been possible for their predecessors due to their deeper association with the regime structures. While both leaders had held high-ranking posts, their profile had been less contentious enabling them to maintain control over the institutional structure as they introduced reforms (on the emergence of reforming leaders from within see O’Brien, 2007). Continuity in this sense enabled the emergent leaders to introduce what they perceived to be reforms necessary to ensure their continued control. In both cases the eventual loss of control did not disrupt the democratisation process, as the leaders had been able to initiate reform internally to safeguard against reversion to authoritarian practices and were willing to accept the outcome. The relative success of democratisation in these two cases warrants continued consideration of the role of incumbent leaders in shaping trajectories around regime changes. Democratisation by its very nature is a period of uncertainty, as roles and institutions are contested and reconstituted. Events in the Arab Spring and the Colour Revolutions show that regime change does not necessarily lead automatically to consolidated democracy. External pressure plays a key role in creating the opportunity for democratisation or reform by introducing a degree of uncertainty, as more actors become involved and take a stake in the outcome. A leader committed to change may be able to draw on this pressure to exercise agency and challenge entrenched institutional practices and patterns. In such situations the actions of the incumbent leader are crucial in shaping the outcome, as it is ultimately the elites that determine how to manage the opportunities and threats that arise. Mainwaring and Pérez-Liñán (2013) note that elite policy preferences (moderate or radical), normative preference for democracy or authoritarianism, and the regional political environment are key in determining whether a process of democratisation will be initiated. In initiating reform the leader’s ability to manage the process and the likelihood of playing a role in the post-transitional context is arguably shaped by four structural factors: authority, institutions, opposition and continuity. Authority refers to the source of the leader’s power and in such regimes is generally derived from performance or personal charisma (Brooker, 2000). The robustness of the leader’s authority will determine their ability to maintain loyalty and exercise agency in shaping political developments. While the reasons for the decision to relinquish power or at least allow reform of the system vary, legitimacy can be identified as an important factor. Where a regime loses support and legitimacy among the wider population it is possible to continue, but internal divisions may emerge as other actors perceive their own positions to be threatened. 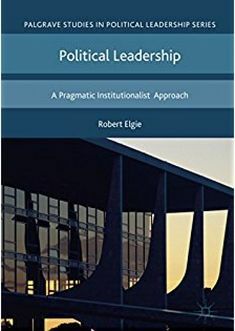 Institutional patterns play a key role in ‘structuring the nature of political competition’ (Elgie, 1995: 23), as they provide a base from which the leader can operate. If these have been neglected or degraded, they are less useful in times of crisis (see O’Brien, 2007 on Boris Yeltsin). As noted above, opposition is significant in pressing for reform, but the location (internal versus external) and strength of this opposition will determine the space the leader has to operate. The accretion of custom and practice over time ties actors into the system, thereby reducing the chances of defection from within, but potentially limiting the agency of the leader by encouraging pressure to maintain the status quo. The institutional form of the regime plays an important role in the decision-making of incumbent leaders. Examining the ability of foreign pressure to force change in non-democratic regimes, Escribà-Folch and Wright (2015) find that personalist regimes are more resistant, as the stakes are higher for the leader without a formalised base. In military and party regimes the existence of a formal support base provides more opportunities in the event of systemic threats. Military leaders are able to return to barracks and exercise some degree of control over the democratising regime, through the threat of force. Party based regimes have less direct control, but possess the ability to participate (possibly under a new name) in the reconstituted system and return incumbent leaders to office. The corporate form of military and party regimes also enables the leader to rely on the hierarchy to ensure loyalty of followers and limit chances of defection, as failure would be costly for the whole of the collective. As noted, the institutional form played a role in both South Africa and South Korea, ensuring stability and a chance that the incumbent leaders may be able to secure a degree of influence over the regime trajectory. Decisions of a leader are central in shaping the likelihood of a move towards democracy, but this does not guarantee that a fully realised democratic system will result, as structural constraints and internal opposition may stall or reverse progress made. Elite preferences determine what tools and direction the leader may choose (Mainwaring and Pérez-Liñán, 2013), but these preferences exist within a social and institutional framework that enables or constrains their actions. F.W. de Klerk and Roh Tae Woo demonstrated through their actions a preference towards greater democracy, reinforced by social instability and external pressure, but it was their control of the institutions of government that enabled this preference to be acted on. The cases also reiterate the importance of the perceived likelihood of post-transition success, maintaining a degree of control over the process. As Escribà-Folch and Wright (2015) argue, in the absence of a post-transition future a turn to repression may be a more viable option. Preferences are not absolute, contextual factors and likely future outcomes condition the ability and willingness of leaders to act on their preferences. Paul Brooker (2000) Non-Democratic Regimes: Theory, Government and Politics. Basingstoke: Palgrave Macmillan. Robert Elgie (1995) Political Leadership in Liberal Democracies. Basingstoke: Palgrave Macmillan. Abel Escribà-Folch and Joseph Wright (2015) Foreign Pressure and the Politics of Autocratic Survival. Oxford: Oxford University Press. Scott Mainwaring and Aníbal Pérez-Liñán (2013) Democracies and Dictatorships in Latin America: Emergence, Survival and Fall. Cambridge: Cambridge University Press. Thomas O’Brien (2007) ‘The Role of the Transitional Leader: A Comparative Analysis of Adolfo Suárez and Boris Yeltsin’, Leadership, 3(4): 419-32. This entry was posted in Africa, Asia, South Africa, South Korea and tagged presidentialism, South Africa, South Korea on June 22, 2016 by Robert Elgie. In recent months, South Africa’s President Jacob Zuma has limped from one political crisis to the next. Last December, Zuma’s decision to replace his respected finance minister with a little known backbencher met with strong opposition, and plunged the economy into a tailspin. Many feared this was a move aimed at freeing Zuma’s hand to loot public coffers and pay off his close business associates. The President’s reputation took another hit last month when members of the Gupta family, owners of a sprawling business empire in South Africa, allegedly offered the current deputy finance minister the top post in the Treasury. Both the Guptas and Zuma denied these allegations, with Zuma affirming that he took responsibility for all government appointments. With that scandal still smouldering, South Africa’s Constitutional Court dealt Zuma a fresh blow. The Court ruled that Zuma’s refusal to abide by the Public Protector’s binding recommendation to repay public funds used to renovate his expansive Nkandla estate went against the constitution. Zuma promptly apologized for the “frustration and confusion” that the long-running scandal caused, but this did little to calm the public outcry. Only days later, parliament debated an impeachment motion brought by the leading opposition party, the Democratic Alliance (DA). While ANC MPs stood together, ensuring the motion failed, the debate itself—broadcast live—revisited all the corruption allegations levied against Zuma. Moreover, it was not opposition politicians alone targeting the president. Shortly after the impeachment proceedings concluded, a number of ANC veterans joined the chorus calling on Zuma to resign. While many observers suggest a big loss for the ANC in August could spell the end for Zuma, others are more sceptical. Zuma still enjoys strong support among rural branches of the ANC, particularly in his home province of KwaZulu-Natal. This local level support reduces the likelihood that the ANC National Executive Committee, the party organ with the power to oust Zuma, will in fact force his resignation. However, even if Zuma does survive through to the end of his term in 2018, he may struggle to anoint his preferred successor, his ex-wife Nkosazana Dlamini-Zuma. This could leave the path clear for the current Deputy President, Cyril Ramaphosa, which according to some might help the ANC reset. Ramaphosa is far from Mr. Clean, though, and it is uncertain whether the challenges currently facing the ANC can be remedied through a simple change of guard. While the political malaise deepens, the economic crisis facing South Africa—whose credit rating is teetering on the edge of junk—shows little sign of abating. Indeed, the political and economic unease go hand in hand, leaving South Africans much the worse for it. This entry was posted in Africa, South Africa and tagged president, resignation, South Africa on April 21, 2016 by Michaela Collord. January has provided no reprieve for South Africa’s embattled President, Jacob Zuma. Anti-Zuma protests continue apace, the most recent headline-grabber being a giant ‘Zuma must fall’ banner erected by activists in Cape Town. Economic indicators meanwhile continue to spiral downward, heralding further political unrest ahead. The IMF recently revised South Africa’s growth projection for 2016, nearly halving its original estimate to a mere 0.7%. This poor outlook is in part due to external factors—notably falling commodity prices and rising borrowing costs. Yet much of this decline is also self-inflicted. It is a testament to Zuma’s dangerous politicking, which in turn, speaks to a more fundamental malaise within the ruling ANC, a party at the mercy of competing patronage-seeking factions. Zuma has had to fight off a succession of political scandals throughout his career. Since assuming office in 2009, criticism over corruption and policy uncertainty has continually dogged Zuma personally, as well as his government. And yet, in December of last year Zuma managed to outdo himself, unleashing market chaos after changing his Finance Minister three times over five days. On December 9, he shocked South Africans and foreign investors alike when he replaced his respected minister, Nhlanhla Nene, with a little known ANC backbencher, David van Rooyen. Rumors quickly spread that Nene was fired due to his unwillingness to sacrifice fiscal discipline in order to satisfy Zuma’s personal political interests. Nene had opposed a bid by the lossmaking state-owned company, South African Airlines (SAA), to renegotiate an aircraft deal with Airbus. The chair of SAA who was in favor of the renegotiation, Dudu Myeni, is a close Zuma ally. What’s more, the President also felt compelled to issue a highly unusual statement, denying allegations that he is romantically involved with Myeni. The apparent sidelining of Nene for political reasons raised serious questions regarding the credibility of the Treasury, long seen as one of South Africa’s strongest institutions. Zuma’s decision sent the rand tumbling to all-time lows against major global currencies. It wiped R169bn of equities listed on the Johannesburg Stock Exchange and R52bn off the local bond market. Protests also broke out across the country as South Africans called for Zuma’s ouster. Facing pressure from within his own party, Zuma finally acquiesced. Four days after he fired Nene, the President announced the return of respected former Finance Minister Pravin Gordhan to head the Treasury. Gordhan has gone some way towards reassuring markets. He has reaffirmed the Treasury’s commitment to fiscal discipline at a time when the cost of repaying South Africa’s public debt has become the single greatest drain on the national budget. He also successfully upheld Nene’s original position, rejecting the SAA bid to renegotiate its deal with Airbus. Nevertheless, observers and financial commentators in particular underscore the lasting damage incurred as a result of Zuma’s gamble. Recent credit rating downgrades have brought South African bonds close to junk status while investors increasingly question the lack of policy direction and the uncertain prospects for South Africa’s commodity-dependent economy. More worrying still is the reigning political uncertainty. Zuma’s own future is on the rocks, with many citing this year’s local government elections as a key test. A poor showing for the ANC could trigger Zuma’s early removal from office. But Zuma’s immediate future aside, a succession battle is already underway for the ANC top post. Next year’s leadership congress is likely to pit Zuma’s former wife and current head of the AU Commission, Nkosazana Dlamini-Zuma, against current Deputy President Cyril Ramaphosa. Zuma’s own preference would be to retain his current position as party leader and to see Dlamini-Zuma becomes presidential nominee. The dynastic quality of such an arrangement is problematic in and of itself, but it would also contravene ANC precedent, which dictates that one person should hold both the position of presidential nominee and party leader so as to prevent competing power centres from emerging. Ramaphosa’s potential candidacy is hardly a reassuring alternative, though, given his own checkered record. Corruption allegations abound while South Africans will not have forgotten Ramaphosa’s alleged implication in the 2012 Marikana massacres and subsequent cover up. For now, the ANC has remained outwardly united in defending its President. However, intra-party tensions abound as competing ANC heavyweights jockey for positions. Against this troubled backdrop, it is unclear how South Africa’s ruling party can prevent what some interpret as the weaknesses of Zuma’s personal leadership style from remaining a fixed element of the ANC status quo. Indeed, Zuma is not alone in his willingness to indulge political cronies; any successor will have his or her own patronage network to satisfy. This situation means it will only become more difficult for the ANC to convince South Africans, as well as foreign investors, of the government’s political (and economic) credibility. This entry was posted in Africa, South Africa and tagged economic policy, president, South Africa on January 22, 2016 by Michaela Collord. Following mass protests by students across South Africa, President Jacob Zuma has moved to freeze tuition fees. However, this strategy is unlikely to pacify students or to enable the ruling party to win back the confidence of urban voters. The future success of the ANC will therefore depend on recalibrating its support base away from urban areas and towards rural locales. The student protests began after it was announced that universities planned to increase their fees by around 11.5% next year. Demonstrations that began at the University of the Witwatersrand on Johannesburg quickly spread, trending under the #feesmustfall hashtag and tapping into deeper concerns about the lack of racial transformation in the distribution of power in key institutions, despite the end of apartheid. The first phase of the protest movement and culminated in a mass protest at the Union Buildings, the seat of the South African government in Pretoria, when over 10,000 people demanded that the fee increases should be scrapped. President Zuma initially offered to cap fee increases at 6%, a significant reduction from the 10-12% that was initially quoted, but a long way from the “free education” now demanded by some students. When this offer failed to move student leaders, the present went a step further, agreeing to freeze tuition fees on 23 October. However, the move left the ANC in something of a bind, as the government was forced to admit that it did not know how it was going to fund the resulting hole in the budget. In reality, the problems facing the university sector are structural and cannot be resolved overnight. Although the government spends more on education than any other single budget item, the proportion of revenue accruing to higher education is relatively small, and in 2012/2013 amounted to just 2.3% of total government spending, or 0.76% of GDP. As a result, the proportion of university income provided by the government fell from 49% to 40% between 2000 and 2012. In the absence of a large increase in private income, universities have made up this shortfall by increasing student fees, which now make up 31% of total university revenue, up from 24% in 2000. These trends have placed universities and students under greater financial pressure. At the same time, growing student numbers has placed the entire system under intense strain. A university sector that was educating 600,000 in 2001/2002 is now educating over 1 million South Africans. Thus, although the total amount of money the government spends on tertiary education has gone up, the funding per student has gone down. One consequence of this increase in student numbers is that at the same time that students are being asked to pay more, many are finding the experience of going to university disappointing and unfulfilling. Resolving these challenges will take far more time and resources than President Zuma has so far proved willing to invest. The president also faces a number of other associated challenges. The student’s victory has emboldened their leaders to campaign for free education. This is something that South Africa would struggle to afford, and is a demand that is likely to go unfulfilled, adding to the sense of disillusionment felt by some of the ANC’s fiercest critics. The longer-term implications of the mounting urban frustration with the president could be far-reaching. Zuma’s refusal to publicly address rallies and protests has led to accusations that he is out of touch with ordinary South Africans. Moreover, this point is being made in increasingly strident language. A student that attended the Union Buildings protest is reported to have said: “Now we know Zuma is a coward. He’s not a man.” Comments such as these a broader concern South Africa’s towns and cities with the direction in which the country appears to be heading: low economic growth, rising corruption, and an absence of clear leadership on big issues. As a result, the South African landscape is increasingly mirroring that of other African states such as Uganda and Zambia, in which governments gradually lost urban support and ultimately depended on rural votes to retain power. The challenge for President Zuma will be to expand the party’s control of rural areas at the same rate that it loses influence in urban ones. This entry was posted in Africa, South Africa and tagged President Zuma, South Africa on November 5, 2015 by Nic Cheeseman. On March 17, South Africa’s National Assembly voted against a no-confidence motion tabled by the opposition party Agang SA. With 113 members in favour, 221 opposed and eight abstaining, it was an easy win for the President. Beyond the official vote tally, however, this was a hollow victory. It left Zuma and his government on the defensive while raising constitutional concerns regarding South Africa’s political system. The March 17 no-confidence motion was not the first Zuma has had to face as President. In March 2010, after only 10 months in office, another no-confidence motion was defeated by 241 votes to 84, with eight abstaining. The main justification for the vote then involved Zuma’s admission that he had fathered a child out of wedlock and concern that he had not declared his financial interests on time. Since this first vote, the list of charges against Zuma has ballooned. The main justification for the latest no-confidence motion was Zuma’s failure to address allegations that he misappropriated R246m of taxpayers’ money to upgrade his country home in Nkandla. During the parliamentary debate, MPs also accused Zuma of fuelling patronage politics in the ANC, mismanaging South Africa’s economy, and sending police to Marikana to kill striking mineworkers in 2012. The debate was all the more heated given the backdrop of last month’s State of the National Address. The usually polite and rule-governed parliamentary chamber looked more like a boxing ring as plain clothes police forcibly removed Economic Freedom Fighter MPs after they interrupted the President’s speech, demanding to know when he would pay back the Nkandla money. The fact that Zuma’s hold on power remains so unshakable despite widespread public outcry has led opposition to point a finger at South Africa’s electoral system. During the no-confidence debate, the United Democratic Movement leader Bantu Holomisa called for a reform of the current system so as to enable voters to elect their President directly. At present, the only way Zuma could be ousted before 2019 would be if the ruling African National Congress decided to ‘recall’ him in the way Thabo Mbeki was removed as president in 2008. There appears, however, to be little appetite within the ANC to engage in another leadership battle. As one observer argues, too many high ranking party cadres, as well as rank and file MPs, see their own political fortunes as somehow tied to the President. This entry was posted in Africa, South Africa and tagged no-confidence, president, South Africa on March 27, 2015 by Michaela Collord.